Howdy. Senior Writer Jason Heller here. The A.V. Club’s monthly fantasy film series, Fantastique, continues tonight at Alamo Drafthouse Denver with a groundbreaking, Mark Hamill-starring, science-fantasy epic from 1977. You know—Wizards. 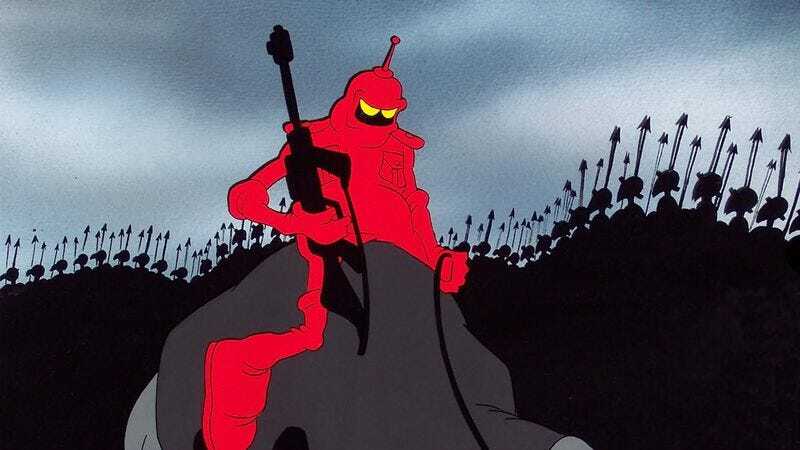 Released three months before Star Wars, Ralph Bakshi’s animated feature Wizards featured the voice talents of a then-unknown Mark Hamill (on loan from George Lucas, who also requested that Bakshi change the name of his film from its original title, War Wizards, in order to avoid confusion with Lucas’ opus-in-the-making). In Bakshi’s post-apocalyptic vision, magic has returned to Earth, and the forces of technology struggle against those of the arcane in a battle for power haunted by the sinister specters of the 20th century. As with every Fantastique screening (as well as every screening of Science Friction, The A.V. Club’s other monthly film series), I‘ll be on hand with my fellow curator and host, Frank Romero, cofounder of Denver Comic Con, to introduce and discuss the film. We’ll also be giving away a copy of the hardcover coffee-table book The Hobbit: The Battle Of Five Armies Chronicles: Art & Design, courtesy of Weta/Harper Design, to a randomly chosen Alamo Victory member in attendance. (If you’re not already an Alamo Victory member, don’t fret, it’s free to sign up.) Tickets to Wizards (in 35mm!) are on sale now.